Tip! How To Remove Stains From Hardwood! Whether dealing with a table or a hardwood floor, removing a stain can be a daunting task. Disaster Blaster gives you tips on how to remove the stain with the least amount of damage to the wood so you can enjoy your furniture or floor once again. Whether it's a stain from a cup that was set down on your coffee table, or a pet stain on your hardwood floor, it's happened to everyone, and can be very upsetting. Is your furniture / floor ruined? Will it require expensive refinishing? What should you do now? The first step is to determine how deep the stain may be. 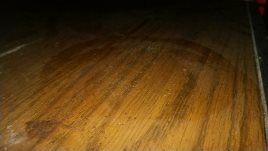 Generally lighter stains, such as a ring around a cup, will be more superficial, while darker stains may indicate a deeper stain that has penetrated the finish on the wood and possibly the wood itself. In this story here, we will focus on superficial stains. • Because of the variety of finishes and woods available, it is recommended to pretest an inconspicuous area. Particularly with abrasive methods or when using a solvent or chemical. • When working with hardwood, it is always recommended that you work with the grain. This greatly limits potential for damage to the wood itself. • Always start with methods that are the least agressive and work your way up. You may be pleasantly surprised to find that more agressive options weren't necessary. • When moving on to a different method, thoroughly clean the area first. • After the stain has been successfully removed, polish or wax the surface. Some methods may remove some of the shine. • Rub the area with an oily furniture polish, mayonnaise, or petroleum jelly. Why Does This Work? : Better for water stains, the oil in these products can displace the water mark. • Put a little toothpaste on a wet cloth and rub the stain gently until the spot disappears. Why Does This Work? : Some toothpastes contain minor abrasives, that will assist you in lifting stains from the clear coat. • Mix equal amounts of baking soda and toothpaste together and rub the stain gently until the spot disappears. Why Does This Work? : By including the baking soda, you are making the toothpaste a bit more abrasive, a little more elbow grease so to speak. • Dip a soft cloth (Such as an old T-Shirt) into a mild solvent (Such as mineral spirits or paint thinner). Squeeze out excess moisture and then rub the stain gently until it is gone. Why Does This Work? : First, make sure to pretest in an inconspicuous area when using any solvent or chemical. Solvents are able to dissolve the stain itself, however can also dissolve things you don't want too, such as the finish. It is important when using a solvent to clean the area thoroughly after finishing. • Apply paste wax with a fine steel wool pad, and gently buff in a single direction, with the grain, until the stain is removed. Why Does This Work? : To start, this method should be considered as a last resort, as it is very agressive, and if done improperly, can damage the hardwood. It is particularly important to make sure that you are spreading the paste wax in a single direction, and with the grain of the wood. This will essentially remove layers of the clear coat from the wood surface, and with it, the stain. When done, remove any excess paste wax from the area, allow the area to dry, and apply a good furniture polish or cream wax to return the shine and finish to your hardwood. Please check back for a continuation of this story where we will discuss Deeper (Darker) Stains and the best steps to remove them, and should you have any questions related to this or any of the services we offer, please don't hesitate to Contact Us.